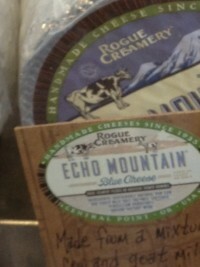 Wednesday, August 8 – morning coffee in town, trip to the Rogue Valley Creamery to buy blue cheese, the chocolate shop to buy (wait for it) chocolate, and then to the Weisinger Winery to sit out on the back deck to sip wine and chat. The time at Weisinger’s ended with a lovely performance by a local wind quartet. Very nice. Dinner at Past Piatti and then more hanging out. Storing up energy for tomorrow which will feature a theatre double-header for the Chervs (MMC matinee and The Very Merry Wives of Windsor, Iowa in the evening). 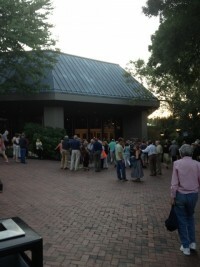 Bob and Chris are also headed for the evening’s performance in the outdoor Elizabethan Theatre. Trip is winding down, but there are still plays to see, dinners to be had, and hanging out to be done. More to come. Stay tuned. Will try to post recent photos from the past several days. Friday, August 3 – no theatre. Serious family hanging out time. Sunday, August 5 – we are joined by Bob’s niece, Andrea Swift. She drove down from her home in Bend to see what we were up to and to join our visit to the Yogurt Hut. Ah, the Yogurt Hut. One of those fix-it-the-way-you-want-it and then pay-by-the-pound places. 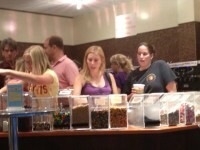 More toppings than a haberdashery and a variety of frozen yogurt flavors. And a second floor with sofas and air-hockey. Wow. Finale of the day was a big family photo on the steps of Carpenter Hall on the bricks at OSF. Monday, August 6 – dark day in the theatre. (Dark day meaning no shows and therefore a day off for our OSF family). 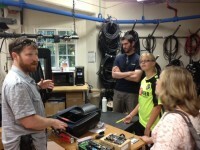 A grand backstage tour for the group, conducted by SoundGuy and LightingGuy. 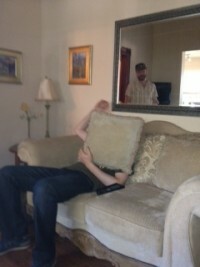 (pictures to appear in a future post.) 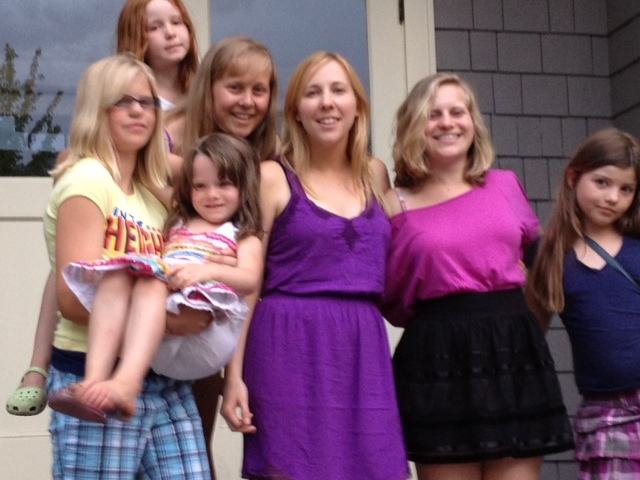 And sadly, Liz returns to New York in the early morning hours and Andrea departs for Bend in the evening. Tuesday, August 7 – on today’s docket – chocolate, wine tastings, blue cheese, and As You Like It on the outdoor stage for the Chevenaks. Hope we can get on the internet long enough to upload this post. Stay tuned. We have rounded the halfway point and are bringing our visit to a close, but there is still much to see and do. PS: We seem to be having difficulty uploading images to this blog post. Check back later for the latest images! 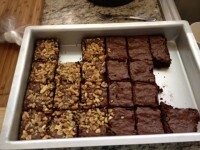 Brownies courtesy of Jacqui’s kitchen. Buster our west coast canine companion. 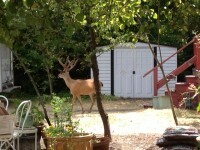 Deer walking through our back yard. The deer roam freely in Ashland. 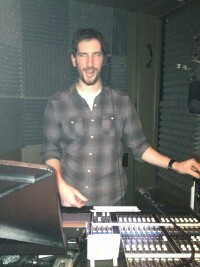 Josh SoundGuy at the mixing board during Party People. The entrance to the elizabethan stage / allen pavilion. 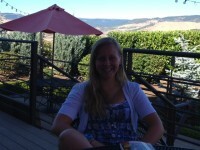 Ashland, August 1, 2012. Too much to see and do. Too little time to write a daily post. So, here is the quick run-down of the past two days of family, food, hanging with the lighting and sound guys and some serious theatre-going at OSF. On the theatrical menu for this day? Animal Crackers with the zany Marx Brothers on stage at the Bowmer Theatre. 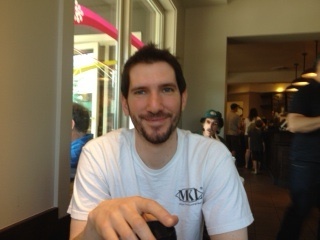 Early morning coffee with Chris, Bob and Liz (and for a brief moment our SoundGuy Josh before he had to go to work) at the Starbucks just off the OSF campus. Everybody who is anybody stops there eventually. So, we thought we would too. 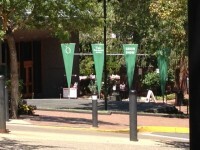 And then on to the OSF campus to take more photos for the blog. And finally, back to the co-op to shop for dinner items. On the menu? 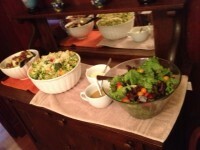 Grilled veggies and chicken caesar salad. 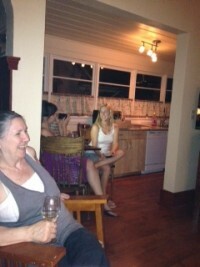 Thanks to Liz and Jacqui for the grilling and the dinner prep. Dinner guests included Bob, Chris, Liz, Josh (SoundGuy), Jacqui, and eventually Noah (LightingGuy). Following the performance we met up with SoundGuy (Josh) and LightingGuy (Noah) for a drink at the favorite company watering-hole, Martino’s. 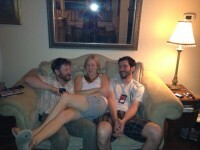 Found many of the AC cast members there, watching the Olympics and blowing off steam after the show. Ran into another of our favorite OSF folks, Gwen Turos. 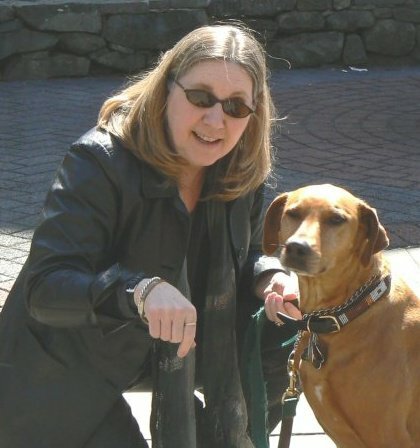 Gwen is the Stage Manager for Animal Crackers and has been a friend for many years – pre-OSF, if you can believe it. 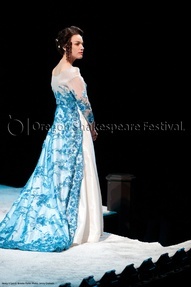 She is also married to Michael Maag, OSF’s Lighting Manager and another of our great good friends out here. Good day. Good bye to Wednesday, August 1, 2012. Another day filled with food, family, and a double-header of theatre. 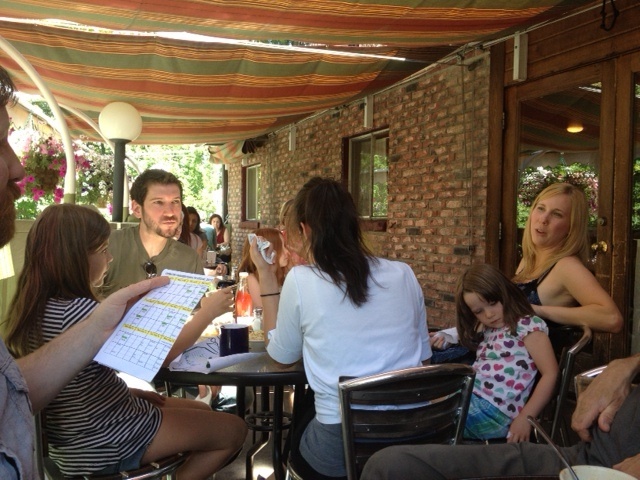 Breakfast at Dragon-Fly with Josh, Jacqui and Liz. Bob had breakfast with our friend Tony Heald, but they sat at a separate table. Wonder what they were talking about? We can only guess. Matinee of Party People with our very own SoundGuy Josh running the front-of-house soundboard. Really, really good. 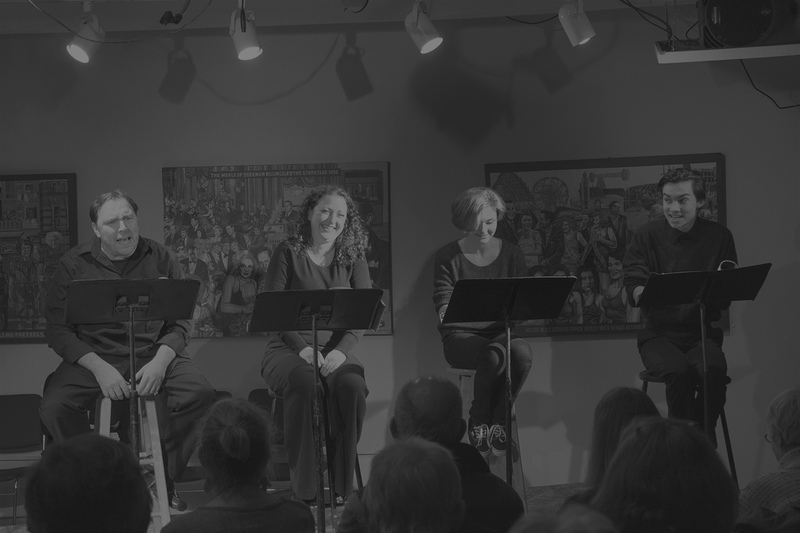 Here’s a bit of the OSF description: “… a high-energy mix of theatre, poetry, jazz, blues, hip-hop, boleros and salsa as UNIVERSES digs into the story and legacy of an American revolution. Four decades ago, the Black Panthers and Puerto Rican Young Lords were young activists providing food and health care in their impoverished communities while in a desperate struggle to survive the systematic dismantling of their movements. Now they are 60-somethings untangling a traumatic past and an unclear future. 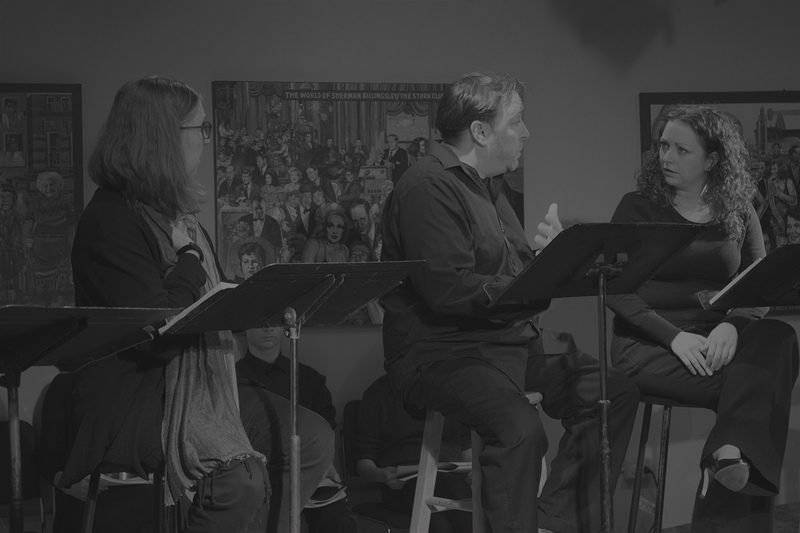 In ensemble, OSF actors and UNIVERSES toggle between then and now in this meticulously researched, compelling work of fiction.” Wow. Just wow. Did we mention that we loved it? Dinner at Pasta Piatti with Josh, Bob, Chris and Liz. 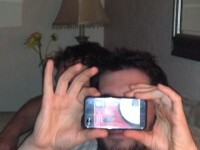 Discussing Party People over red wine and mushroom risotto. 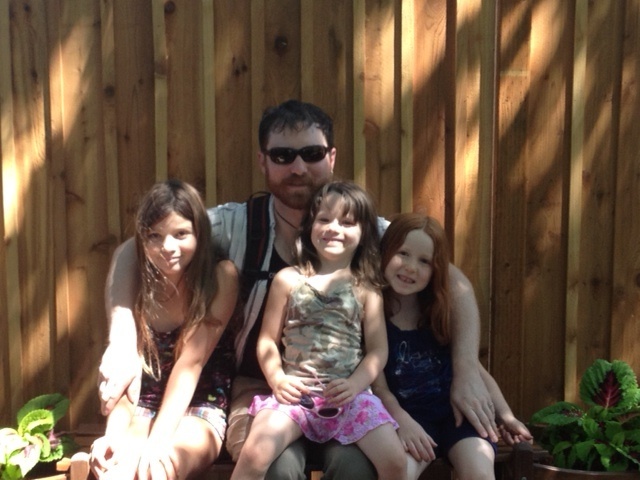 All-too-short visit on the back deck with Noah and his girls (and Buster), and Jacqui. And then on to the second show of the day. 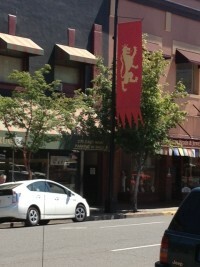 (Ah, Ashland.) On the menu for the evening? The very ambitious Medea, Macbeth, Cinderella. OSF refers to MMC as a “A three-ring tour de force” Here’s their description: “A jealous wife sends an unthinkable message to her cheating husband. A lord, urged on by his aggressive lady, murders his king. A mistreated stepdaughter engages with magic for love and happiness. Three plays from two millennia of populist theatre—Greek tragedy, Elizabethan drama and American musical comedy. . separate stories of ambition interweave into one revelatory whole that builds to an unexpected climax.” Another opportunity to see our SoundGuy in action, mixing all of those actors as they play out the three separate stories, playing out simultaneously. Yikes! Good job Josh. A visually stunning production as well. Beautiful to just sit back and watch. 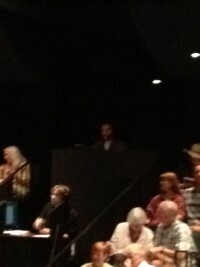 SoundGuy at the MMC board. Totally rogue photo, taken by sister Liz, at the back of the Bowmer Theatre, without the knowledge of the usher, on August 2, 2012. Back to our little home away from home. Late. Tired, but happy to be here. Tomorrow? No scheduled theatre. Time with the family. Lunch with old friends. Aware of how quickly the time is passing. Stay tuned. 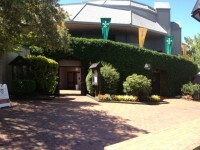 The entrance to the Elizabethan Theatre. Ashland, August 1, 2012. 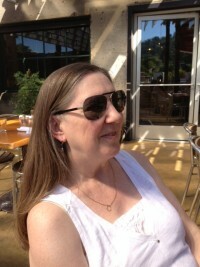 Liz with her new sunglasses, sitting in the sun outside Starbucks. Ashland, August 1, 2012. 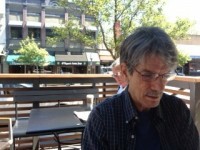 Bob at Starbucks, Ashland, August 1, 2012. 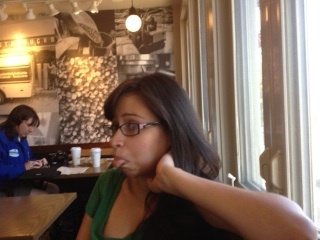 Liz attempting to stop the taking of her photo at Starbucks, Ashland, August 1, 2012. On The Bricks, OSF, Ashland, August 1, 2012. On Main Street, Ashland, August 1, 2012. 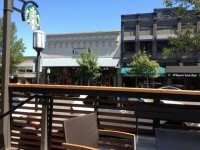 Looking across Main Street from Starbucks at Paddington Station (Jacqui’s favorite store), Ashland, August 1, 2012. Street banners announcing that OSF is “in season” are everywhere in town. 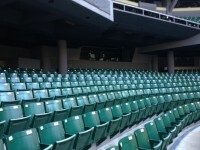 Seating inside the Elizabethan Theatre (aka The Lizzy), OSF, Ashland, August 1, 2012. 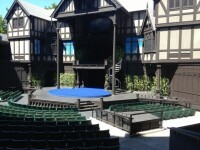 Stage of the Elizabethan Theatre, Ashland, August 1, 2012. Audience seating in the Elizabethan Theatre (“the booth” is visible on the back wall) Ashland, August 1, 2012. Manhattan street corners aren’t the only places to find strange sights. 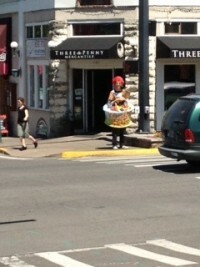 Check out this Yogurt Guy on the corner of Main and Pioneer in Ashland on August 1, 2012. 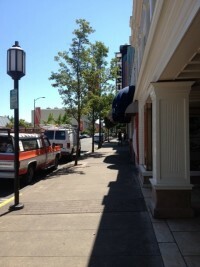 Main Street, Ashland, August 1, 2012. 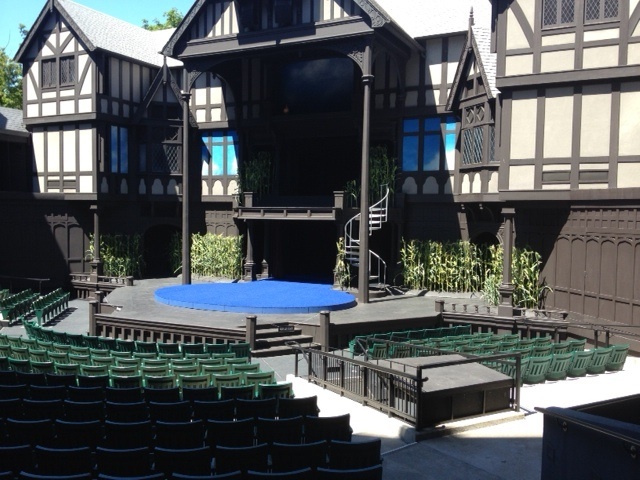 The stage in the Elizabethan Theatre in the afternoon, set for the evening’s performance of The Merry Wives of Windsor, Iowa. Ashland, August 1, 2012. 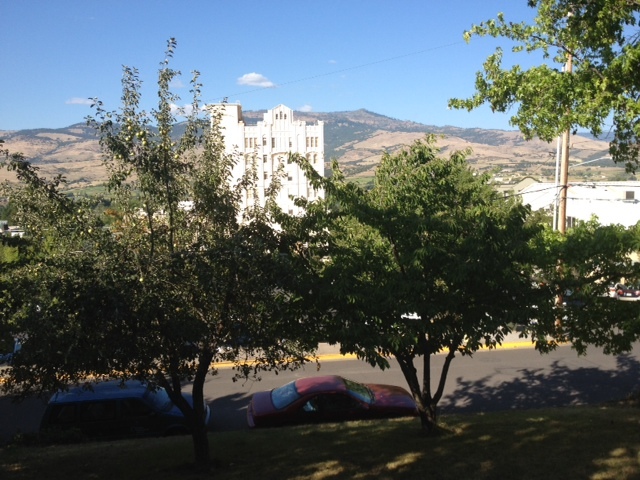 Exterior shot of the New Theatre, OSF, Ashland, Oregon. Audience on the bricks before the evening’s performances. 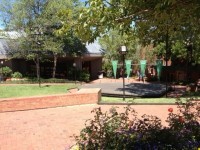 The Bowmer Theatre in the background. August 1, 2012. 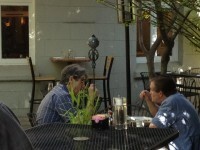 Bob and Tony at breakfast, August 2, 2012. 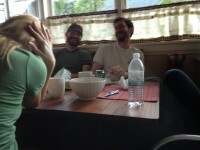 Bob and Tony and Josh’s shoulder at breakfast on August 2, 2012. Liz and Jacqui at breakfast on August 2, 2012. 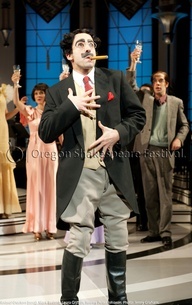 Animal Crackers, OSF, 2012. Photo by Jenny Graham. Party People, OSF, Ashland, August 2, 2012. Photo by Jenny Graham. The sisters (3 weird and 2 ugly) from Meda, Macbeth, Cinderella, OSF, Ashland, August 2, 2012. Michael Maag, OSF Lighting Department Manager, and Noah Beauregard, OSF Master Electrician, on tech set for OSF’s production of Henry V in the outdoor Elizabethan Theatre. Photo by Jenny Graham. 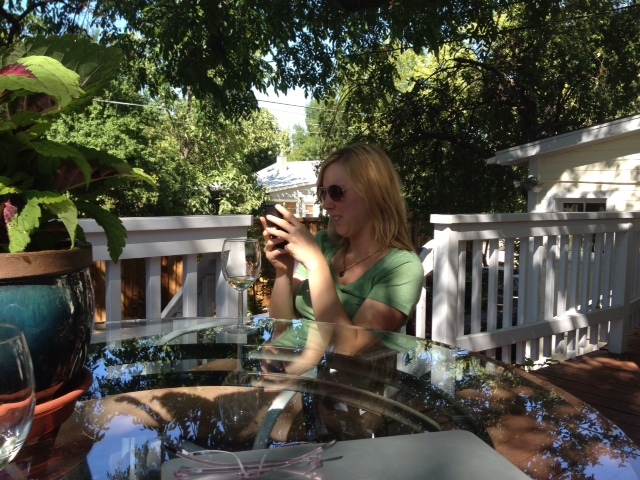 Liz enjoying a beautiful morning – checking her email in the gorgeous cool morning air out here in Ashland – on the back deck of our little abode. Tuesday morning – spent just hanging out, writing a blog entry of our weekend adventures, and eating a delicious breakfast out on the back deck. Eggs and turkey bacon, lovingly prepared by Mr. Bob (or Groovy to those who know him best.) And then – on with the day. 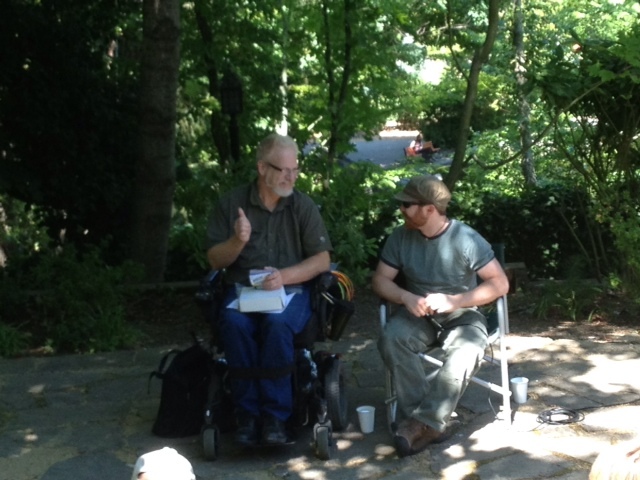 Michael Maag and Noah Beauregard, Park Talk, July 31, 2012. 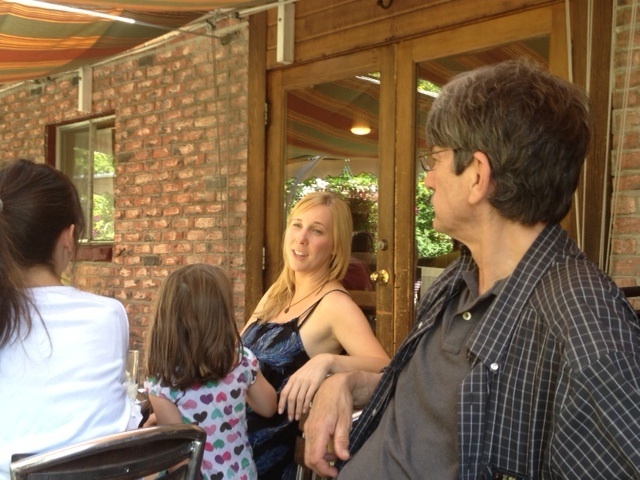 Following the Park Talk, we hung out with Michael and Noah having lunch at the Standing Stone Restaurant. Great lunch, good conversation, but the best part was Michael bringing along that sample LED-thingy which he had used during the Park Talk. It made a stunning table arrangement and Michael had several offers to purchase it. 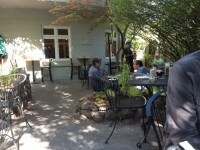 Michael Maag, Standing Stone Restaurant, Ashland, July 31, 2012. Afternoon spent window shopping (Chris & Liz), napping (Bob), and working (Noah, Josh & Jacqui). 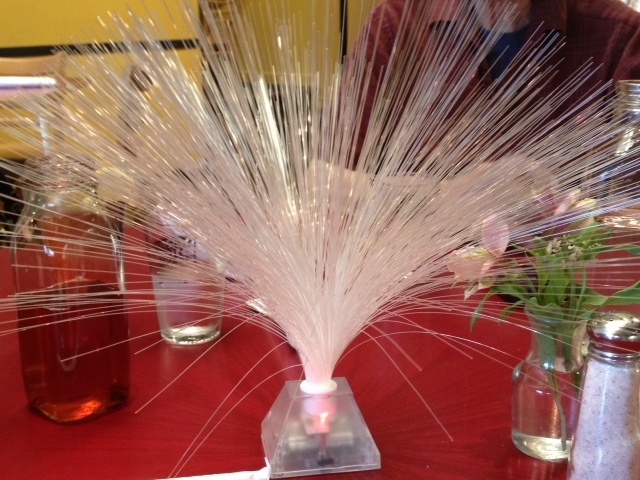 LED table decor, courtesy of Michael Maag. Standing Stone, Ashland Oregon. July 31, 2012. 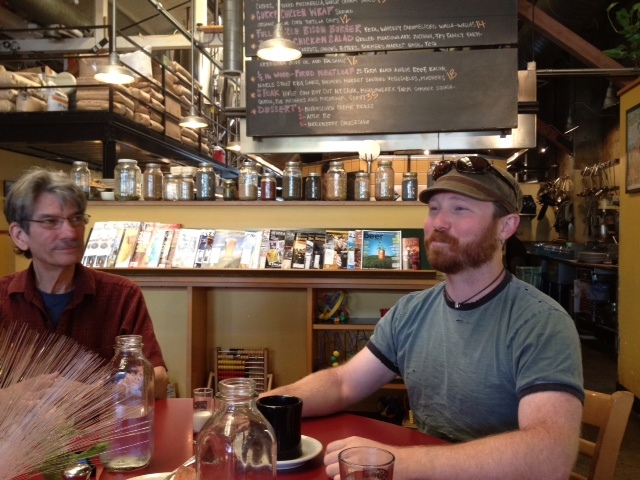 Noah and Groovy Bob at lunch, Standing Stone, July 31, 2012. Late afternoon spent hanging out on the back deck with a little wine and cheese, followed by sandwiches from the new deli in town. Best part of dinner? 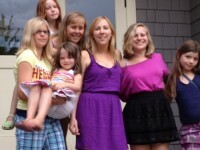 We were all together – Bob, Chris, Noah, Liz, Josh & Jacqui. Our own little band of brothers and sisters. Much laughter. Nothing better. Nothing at all. 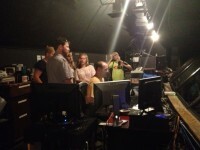 Tuesday evening, our first taste of OSF 2012. 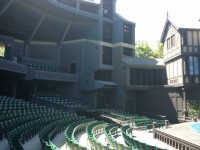 Up to bat: Henry V on the outdoor stage of the Elizabethan Theatre. Sitting in the balcony (on an aisle seat – thank you, Noah) and watching the sun set behind the stark, stunning OSF production of this inspiring play. Having read the play several times but never actually seen it performed, I am happy to say that this is a really good production. Well-directed. Well-acted. Moves right along, no muss, no fuss, just the plot ma’am. OSF’s production of Henry V, Ashland, July 31, 2012. And THE speech was beautiful, absolutely well-done. Take-your-breath-away good and very different from any other delivery of that speech I have ever heard. Well-done you few, you happy few, you band of brothers. 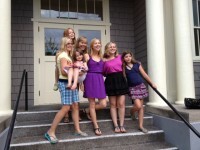 What a great start to the theatre portion of this summer trip to Ashland. 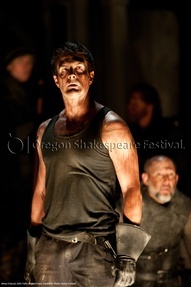 John Tufts as Henry V, OSF, Ashland, July 31, 2012. Photo by Jenny Graham. And so ends our Tuesday. Now it’s on to Wednesday, another lazy blogging morning, lunch with Noah, dinner adds in Josh & Jacqui (hopefully), and then ending with the Marx Brothers and Animal Crackers. Until then, we will just enjoy our own little band of brothers (and sisters). Wednesday’s adventures will include Animal Crackers. 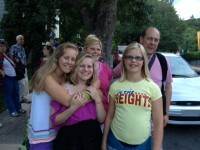 The first two days of our visit have been dedicated to some serious hanging out with family and friends. Sunday Brunch on the deck of our little home-away-from-home with Grandma Chris, Grandpa Bob, Jacqui, Noah and the girls. The view from the porch of Josh and Jacqui’s apartment. Ashland, July 2012. A late night airport pick-up, involving Chris & Josh (the picker-uppers), Liz (the pick-upee), and a Special Hand-Made Greeting Sign (made by anonymous). 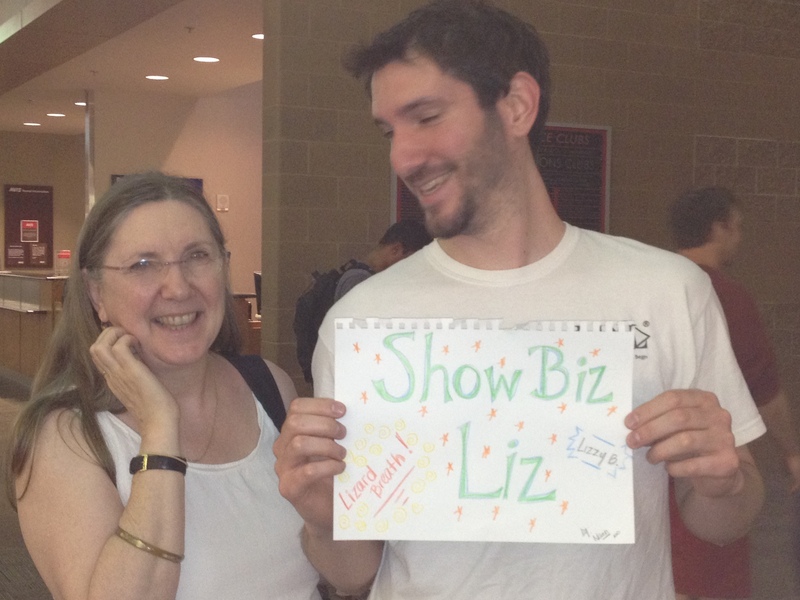 At the Medford Airport, Grandma Chris and Uncle Josh, picking up Show Biz Liz. July, 2012. 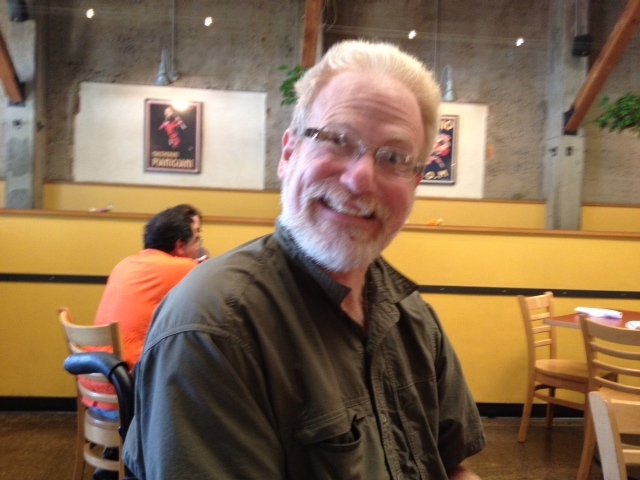 Monday lunch on the deck at Greenleaf Restaurant, following a back-stage tour of OSF, personalized especially for a friend visiting Ashland from – what for it – New Paltz. 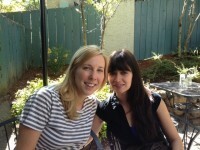 It was good to see Irene Berner and spend a little bit of time with her out here on the Left Coast (as she calls it). And finally, a wonderful Monday Family & Friends Dinner at the home of our long-time friends Tony and Robin Heald. 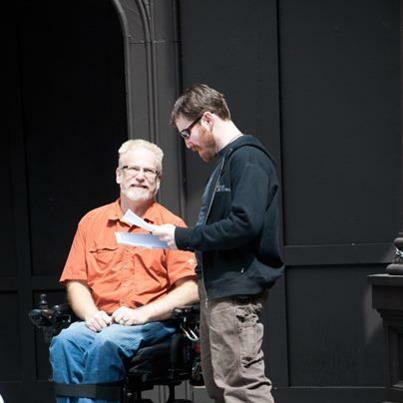 (Tony has been a friend for many years and has also been an actor with OSF for years as well as NYC, films, tv, etc. 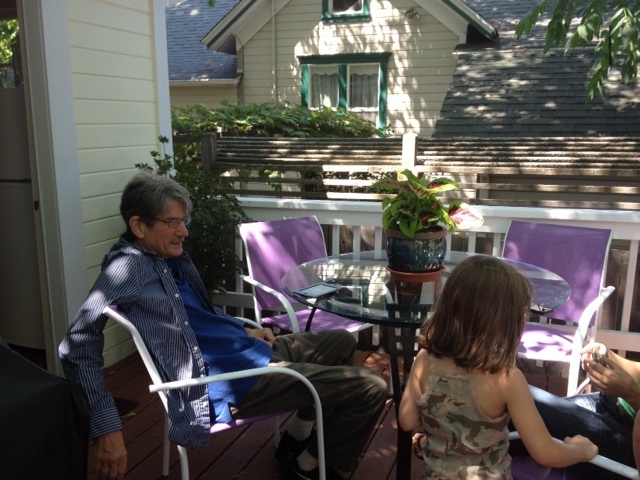 and Robin’s pre-school has been a sweet home for two of our three granddaughters.) Everyone was there. 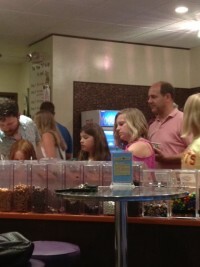 Tony and Robin and their children, Zoe and Dylan. 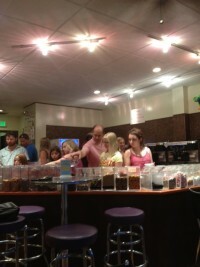 And all of our brood, Noah and his girls, Josh and Jacqui, and our daughter, the famous Show Biz Liz. So, that’s just the first couple of days. Tuesday we start adding in the serious business of theatre-going with an evening performance of Henry V in the outdoor Elizabethan Theatre. But more of that anon. Until the next post, we leave you with a few more photos from these first few days. Grandma Chris and Grandpa Bob and all of the good folks at MMSC! 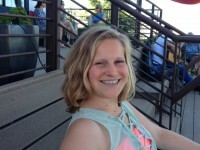 Lunch at Greenleaf, Monday, July 30, 2012. Liz and Bob. 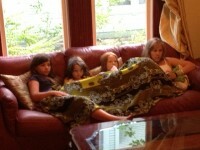 Noah and the girls (Stella, Zoe and Nellie), Ashland, July 29, 2012. So, there we were. Finally, it was Saturday, July 28, Departure Day, and we were finally heading out. The substance of our lives for the next two weeks packed into two small suitcases. Much thinking about “do I really need this?” comes into play when facing the restricted space of a suitcase. But I digress. I found myself thinking about gateways. 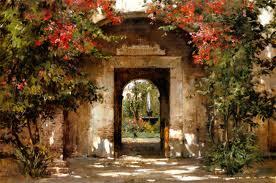 Do gateways lead us out of a place or do they lead us in? Do we find ourselves walking away from something familiar with a sense of loss or toward something else with a sense of wonder and anticipation? And interestingly, how many gateways do we encounter in the course of our day and just never stop to think about the process of leaving and entering, going and coming, departing and arriving? Here are but a few of the many gateways that Bob and I encountered as we made our way from New Paltz, New York to Ashland, Oregon on July 28, 2012. Here’s Gateway #1 for us as we departed from our home in New Paltz. This is an example of a Leaving Gateway. 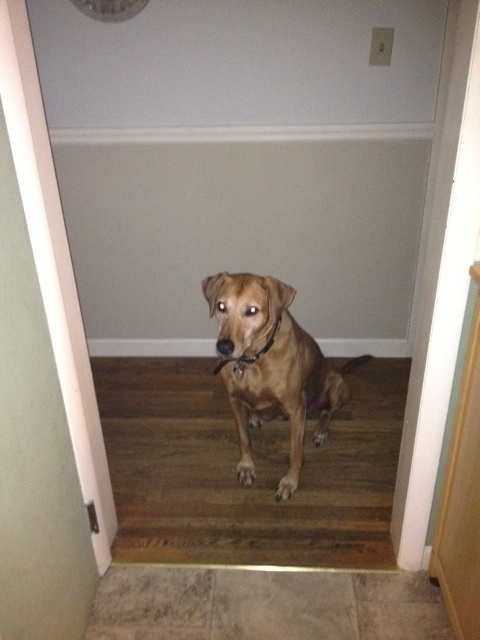 This is our Rhodesian Ridegback, Mia, sitting on the “being left” side of this particular gateway. She was highly suspicious of those creepy suitcase things. Little does she know however that she will be spending the next two weeks with her very good friend, Craig Chapman. 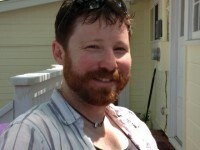 Craig is not only house-sitting, but plans to take Mia on her very first New Paltz Kayaking Tours adventures! Bye, bye Mia. We will miss you. We started out, bright and early, at 7 am (EDT). Our good friend, and fabulous driver, Don Wildy took us all the way down to JFK. (Wait a minute. Isn’t “all the way” supposed to be LBJ, not JFK? Never mind.) 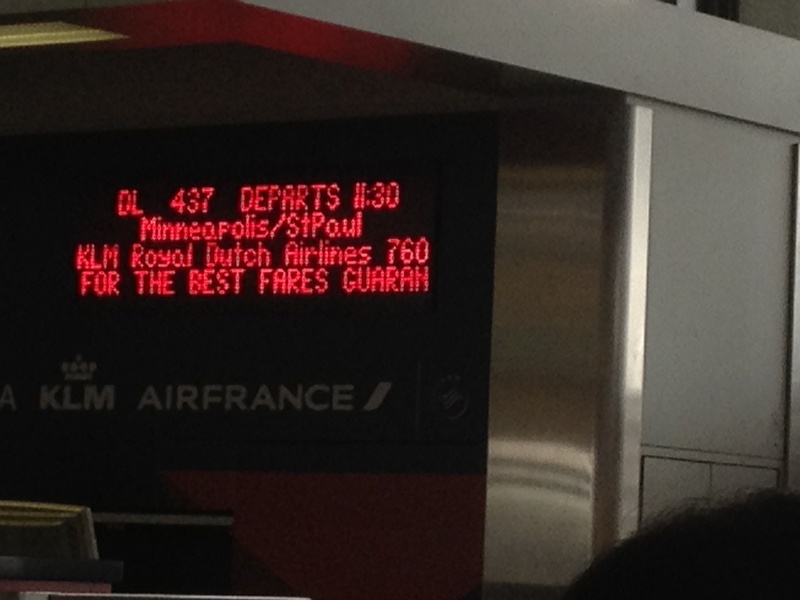 We breezed through ticketing and security and walked through many a gateway on our way to find our Gateway to Minneapolis. Oh, yes. The pathway from New Paltz to Ashland is not particularly straight: New Paltz – JFK – Minneapolis – Portland – Medford – Ashland. So, this is only one of many stops and gateways. 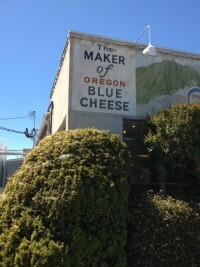 One of the last Gateways of the Trip – our Gateway to Medford, Oregon. Almost There. 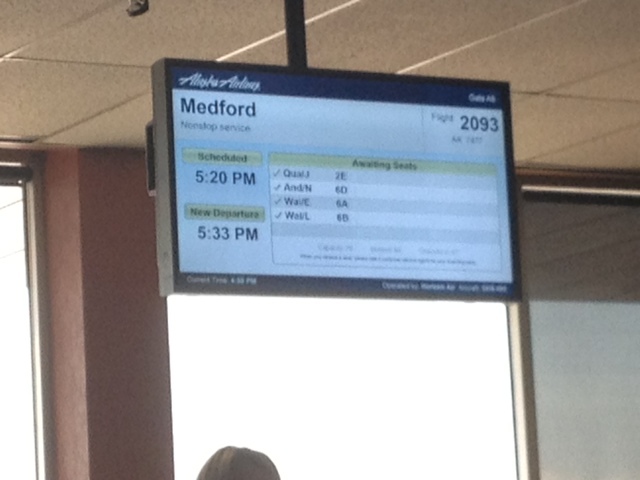 Only one more leg of today’s trip once we land in Medford. A quick car ride from the airport at Medford to the wilds of downtown (???) 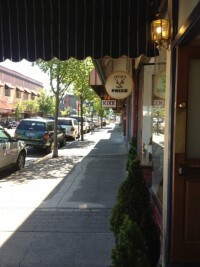 Ashland and our little home-away-from-home on B Street. And beyond that final Gateway of the day was this happy little scene. 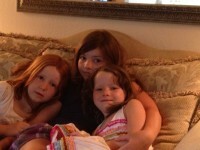 Our reunion with our granddaughters, Stella, Zoe & Nellie. We haven’t seen them since the summer of 2010, so this was a happy reunion indeed. This is an example of an Arriving Gateway. 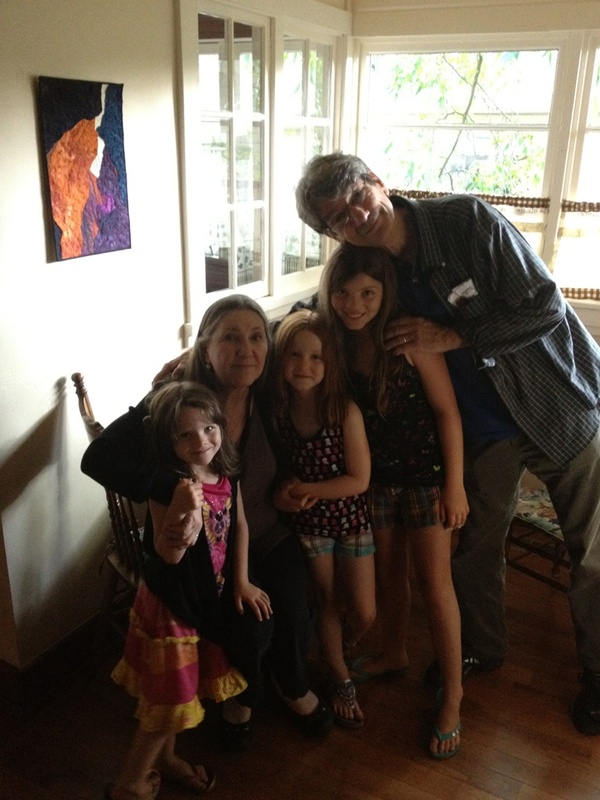 Grandma Chris, Grandpa Bob & the girls (Nellie, Zoe and Stella) – Ashland, July 28, 2012to Ashlandand the final Gateway of this day’s journey, leading to what lies beyond the Gateways of July 28, 2012. Stay tuned. 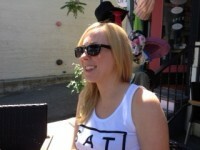 Tomorrow’s adventures will include: having coffee, hanging out and stocking up at the Ashland Food Co-op. The fun is just beginning. By the way, we heard from our faithful house/dog-sitter Craig that the weather in New Paltz was too stormy for safe kayaking. So, Mia’s plans to become the official mascot for New Paltz Kayaking Tours will have to be put on hold for another day. 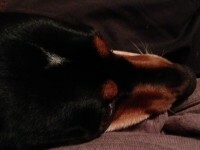 Saturday’s adventures for Mia included napping and napping and eating and napping. Maybe Mia should start her own blog and share her adventures. Before we head out, where are we headed? On Saturday, July 28 MMSC’s co-founders, Robert (Bob) Miller and Christine (Mom) Crawfis, are heading off to Ashland, Oregon. For those of you who know us, you will understand only too well what draws us to Ashland. 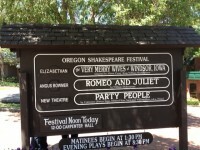 And of course, great theatre at the Oregon Shakespeare Festival. But for those of you who may be interested, here’s the Quick Facts portion of the program. Ashland is located in the foothills of the Siskiyou and Cascade ranges, about 15 miles (24 km) north of the California border on Interstate 5. As of July 1, 2011, the city had a total population of 20,255. It is the home of Southern Oregon University and the Oregon Shakespeare Festival. Ashland is 350 miles north of San Francisco and 285 miles south of Portland in an area once proposed to become the State of Jefferson. It is 90 miles (140 km) from Crater Lake National Park and Oregon Caves National Monument. One of America’s oldest Elizabethan theatres, the Elizabethan Stage is named for a queen and the glorious age in which Shakespeare wrote. Beneath a canopy of stars, in the comfort of the Allen Pavilion. Seats 1,190. 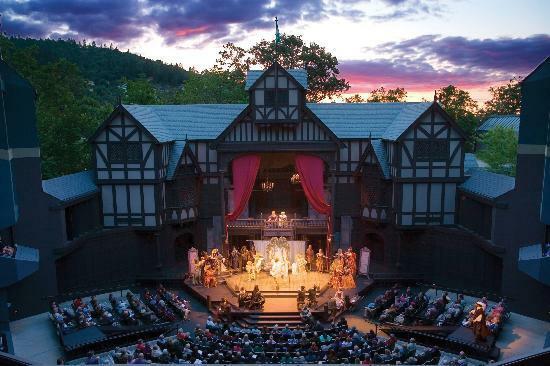 Ashland is well known for the Oregon Shakespeare Festival (OSF), which brings thousands of visitors to the city every year. 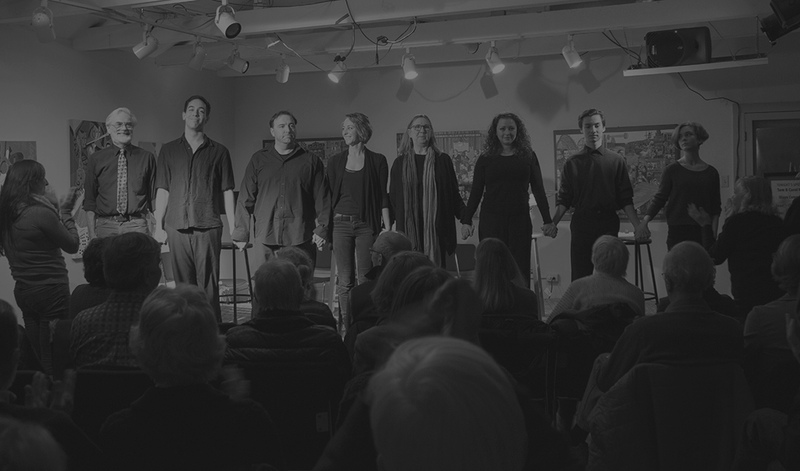 The festival has grown from a small summer outdoor festival in the 1930s to a full season which stretches from February to late October, incorporating Shakespeare and non-Shakespearean plays in rotating repertory at three theaters. OSF sells more tickets to more performances of more plays than any other theater in the country. In a typical year, OSF sells more than 350,000 tickets and attracts over 100,000 tourists. This summer our plans include OSF performances of Animal Crackers, Medea – Macbeth – Cinderella, Party People, All The Way and The Very Merry Wives of Windsor, Iowa. Details to follow. So, that’s the low-down. Now it’s time to figure out how to get two weeks worth of clothing into one small suit case a piece. Don’t really fancy paying that $25 per checked bag thing. It’s been a long time since either of us used a laundromat. Might be time to stock up on quarters, eh? Check back again on Friday to see how the packing turns out! old creative batteries. So, what better time to start our MMSC blog and record our adventures, reactions and photos, and to share them all with you. So, pull up a seat and follow us as we head out. Stay tuned.